This is a lab that you can do and all you need is crayons, hot water, foil, glass beaker, and a pencil sharpener. 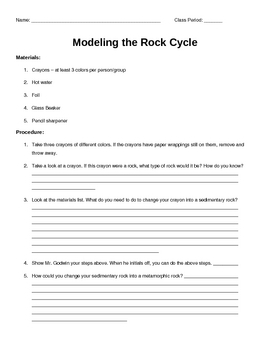 Students work in groups and use the scientific method throughout the lab in order to design an experiment to change their rocks to another type of rock. 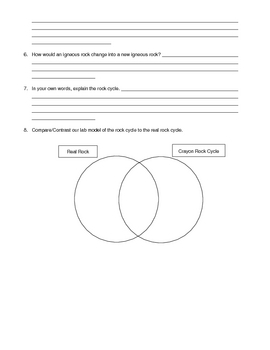 Students need to choose three different color crayons to represent the 3 types of rocks, then must design experiments to change rock types. 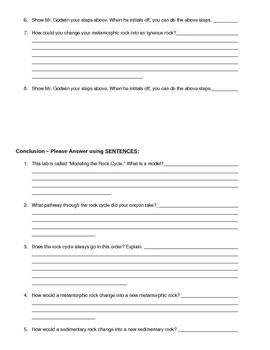 It worked really well with my classes, they really realize that their is not just one set path on the rock cycle...that their are many! Have fun!